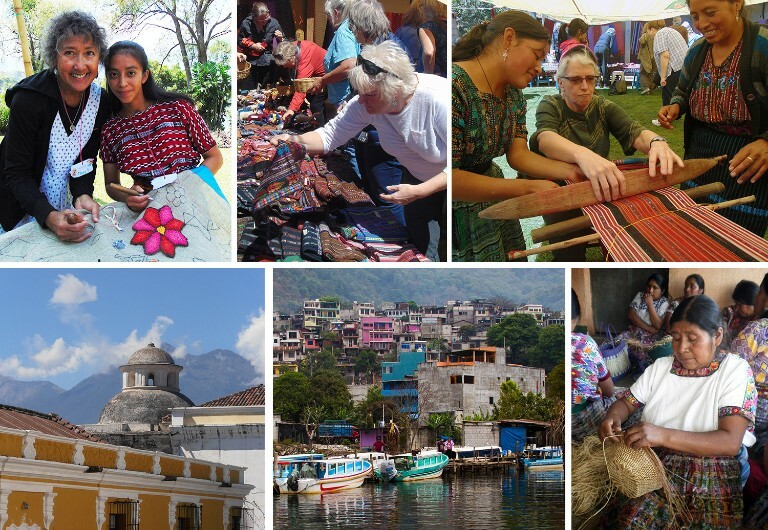 Join us on an 11 day Textile Arts Tour of Guatemala – Textile Center’s 2nd International Tour! Co-presented by Textile Center and Multicolores – a Guatemalan nonprofit that supports talented and motivated women artisans through craft development, education and cultural exchange. Guatemala is a country steeped in textile traditions. The Maya people have a rich history of weaving and other crafts handed down through the generations. Travel the Highlands visiting artisans with a focus on textiles. Learn about the Maya culture and the Maya peoples’ lives while visiting their homes and communities. In Momostenango meet Demetrio Ramos, a 70 year-old weaver of old style “acordando” blankets, both artists Juan de Dios Rodas Galvez and Demetrio Ramos appear in the book, Traditional Weavers of Guatemala: Their Stories, Their Lives by Deborah Chandler and Teresa Cordon. Visit and learn about the rug hooking project at Multicolores’ home in Panajachel, artisans will discuss the impact of rug hooking on their lives and demonstrate the technique. Visit and tour of San Juan Comalapa known for a tradition of primitive folk paintings of village life, ceremonies and legends that began with local artist Andres Curruchich (1891-1969), optional workshop on baskets, textiles or painting. Shop at Guatemala’s biggest and best handicraft market of Chichicastenago where K’iche’ Maya artisans sell woven textiles, ceramic pots, wood carvings, masks, jewelry and much more! Textiles from simple woven items to home décor to intricate weavings and blouses “huipiles”; fabric “corte”; wood carvings and painted animal masks, jewelry and jade pieces, beading; paintings in a variety of styles; ceramics and basketry; embroidered pieces. Tour limited to 14 travelers plus Karl Reichert, Textile Center Executive Director and Tour Leader Jody Slocum of Cultural Cloth, Maiden Rock, WI. The price of the tour is $3,825 plus airfare, based on double occupancy.